August 4, 2018, in her home, with family at her side. She was born February 6, 1947, in Red Top, Missouri, the daughter of Glen and Dora (Davis) Mattox. She was united in marriage to Ronnie Keithley on May 7, 1981 and they have made their home in Clever. Linda was a longtime member of the Jamesville Southern Missionary Baptist Church. She enjoyed caring for her family. Her relaxation time was spent crocheting and embroidering many beautiful pieces for her family. After the children were grown, Linda and Ronnie loved many motorcycle rides and traveling. Linda was preceded in death by her first husband, Larry Junior Keithley; a great granddaughter; her parents; one brother and one sister. 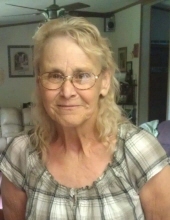 She is survived by her husband, Ronnie; a daughter, Jennifer Williams (Dwight); eight sons, Mark Keithley (Heidi Wilson), Theodore Keithley (Tonua), Brian Keithley, Jeramy Keithley (Summer), Lucas Keithley,(Kara), Larry Keithley (Leslie), Ronnie, Jr”Dozer” Keithley (Kristy; and Zachariah Keithley (Kelsie Killingsworth); 20 grandchildren; 14 great grandchildren; a brother, Garold Mattox; one half brother, Bill Keithley (Tonya); other relatives and many friends. There will be a visitation from 5 to 7 p.m., Wednesday, August 8, 2018, with the funeral service at 10:30 a.m., Thursday, August 9, 2018, in Meadors Funeral Home, Clever Chapel. Burial will follow in Union Ridge Cemetery, south of Clever. To send flowers or a remembrance gift to the family of LINDA KAY KEITHLEY, please visit our Tribute Store. "Email Address" would like to share the life celebration of LINDA KAY KEITHLEY. Click on the "link" to go to share a favorite memory or leave a condolence message for the family.